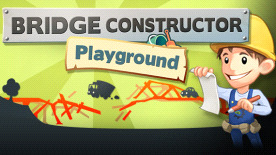 In comparison to the #1 hit Bridge Constructor, Bridge Constructor Playground offers an even easier entry to the game incl. an extensive tutorial. With no fixed budget, and next to no limitations on building materials, there are almost no limits: you can build and construct to your heart’s desire. Here you are free to do as you please and let the time fly by with creative bridge building. Experienced players will enjoy the challenges of the new badge system: for every bridge there are 5 badges to be won for which you must fulfill certain requirements. For example, building a bridge that can carry no more than a certain load limit. All of this, paired with a bright and friendly look, makes Bridge Constructor Playground an exciting and also educational experience for the whole family, offering hours of gaming fun. (c) 2014 Headup Games GmbH & Co. KG, all rights reserved, www.headupgames.com, ClockStone and its logos are trademarks of ClockStone Software GmbH.